What defines a territory? Where does a line start and end? Who occupies which space and when? How do we negociate and navigate a shared space? 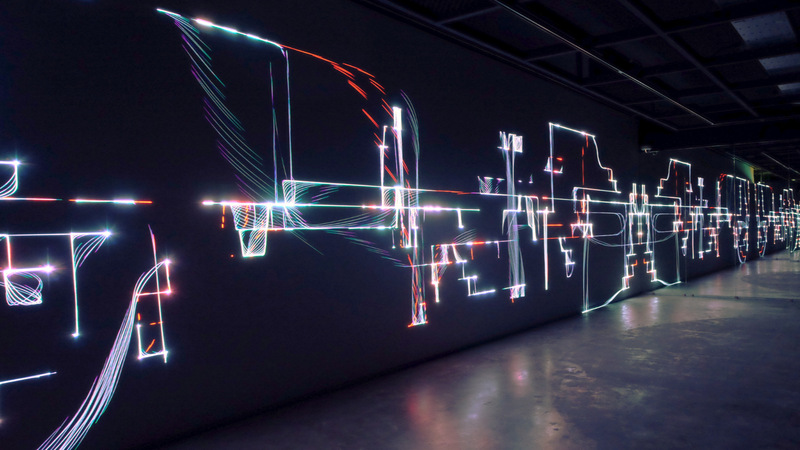 Fragile Territories uses four lasers, each contributing to a complex and mutating visual shape, overlapping lines, rigid grids, loose shortcuts, A painting of light, osciallating between static geometry and fluent ephemeral strokes of color. Sometimes the shapes are barely visible, sometimes they explode into extreme brightness. In some sequences the quality of the light is steady, during other times it fluctuates and breaks apart into scintillating particles. Sounds - transformed recordings of a low piano keys and tiny high pitched mechanical noises - fill the room, sometimes in sync with the visual aspects and sometimes running simply in parallel. Whilst everything is floating and happening in rather long intervals, a constant black shadow is moving in front of the projection, from left to right, every 6 seconds, like a giant blade of a windmill, a negative object that contrasts the bright projection by muting it where it appears. It is not only obscuring the image but also dampening the sounds at its current position and emitting a low frequency noise itself. What is not visible is more powerful than what you see. 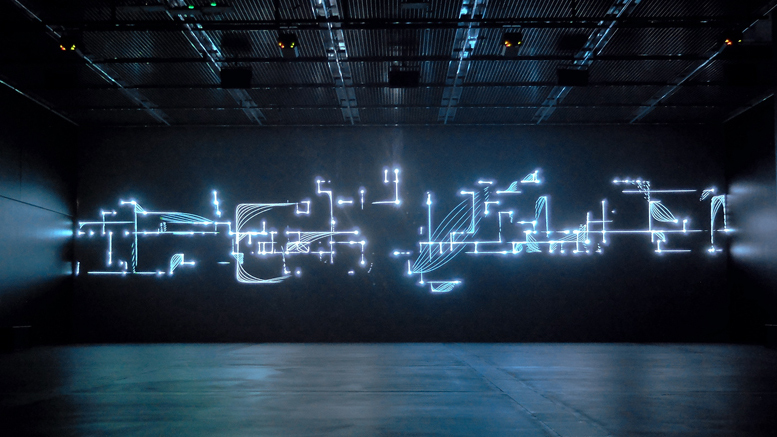 The visual and the auditive sequences are created in realtime using statistic and stochastic algorithms. As a result, the duration of the work is infinite, it never repeats, and the exact behavior is unpredictable. 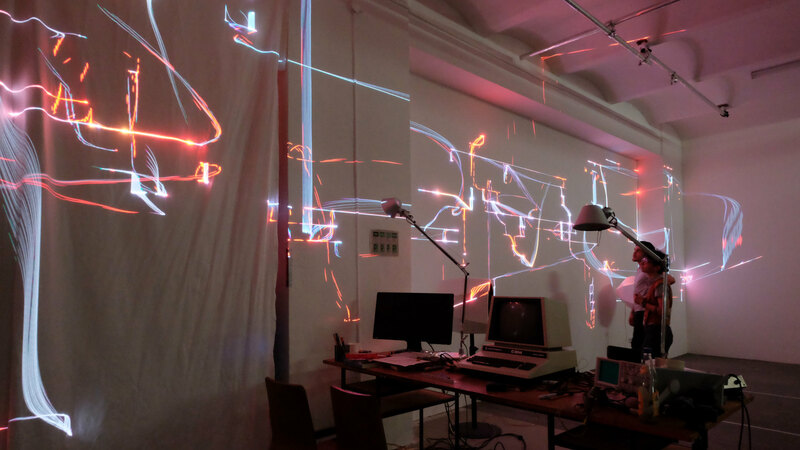 The development of this installation has been made possible by the generous support of LaserAnimation Sollinger [link]. Fragile Territories is a commissioned work by Le Lieu Unique, Nantes, France. 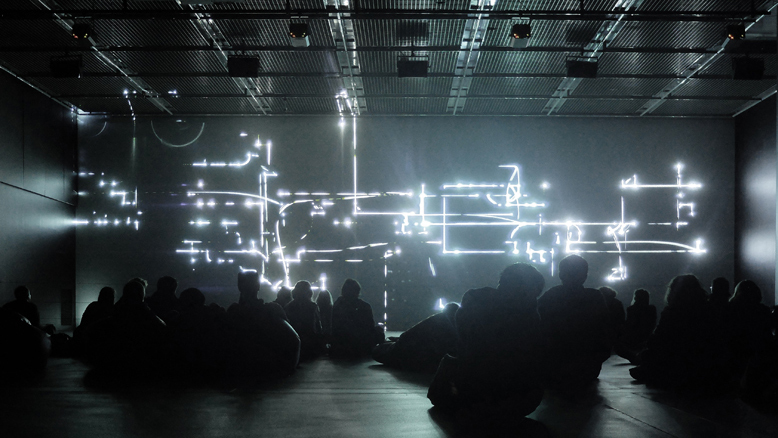 Software development, musical composition, and visual design by Robert Henke 2012-2014, 2016 and 2019. Fragile Territories won the International Laser Display Association (IDLA) Award 2013. 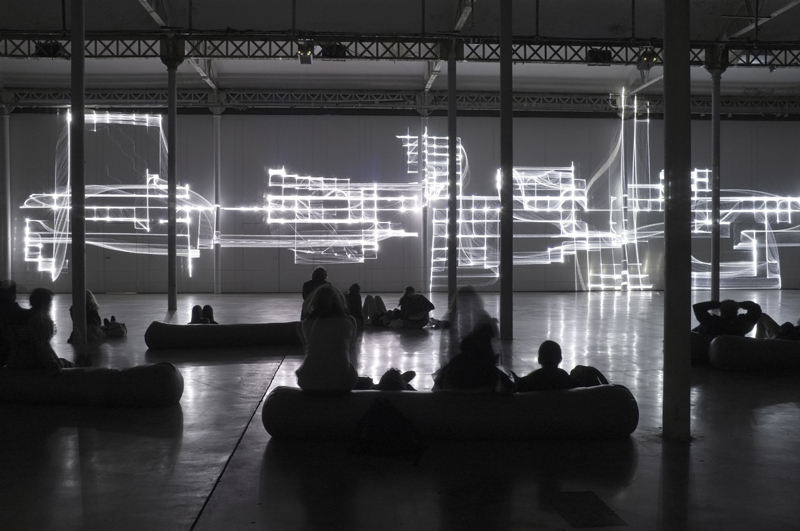 Photos above from the installation in Nantes 2012, Photo below from the installation in Rennes 2014. 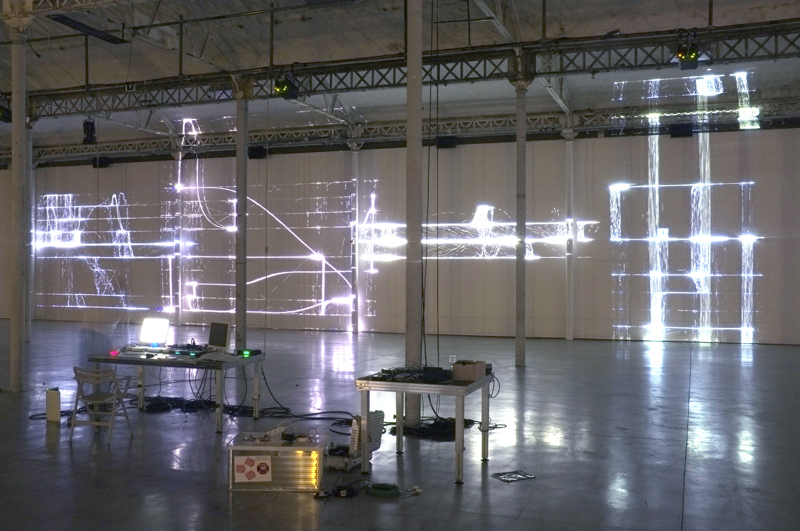 Below: Setting up Fragile Territories in Nantes at Le Lieu Unique, November 2013.